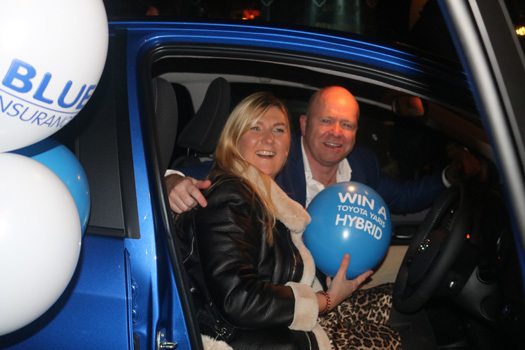 Donna Kenny from Cassidy Travel is this year’s winner of the Blue Insurance win a Toyota hybrid competition. With 13 finalists vying for the top prize, each one had to pick a key number from an envelope – and then later try to open the car from Toyota Sandyford using a key fob. Only two agents – Donna and Toni Fennell from Abbey Travel – had fobs that clicked open the doors. The finalists then had to choose how many Blue Insurance balloons were inside the car, with Donna emerging the winner. Blue Insurance’s Ciaran Mulligan thanked the trade for supporting the competition – watch video here. While to watch the finalists vying for the prize on Dublin’s Clarendon Street, watch video here. For a full gallery of the night’s entertainment and nail-biting competition, connect here on Facebook.